Born in Kabul, Afghanistan, Humaira moved with her family to Pakistan to escape the chaos in her country. In 2000, at the age of eighteen, she returned to Herat, Afghanistan, where she experienced the Taliban oppression, especially of women. For a year she taught the Koran to women in a secret school. When the Taliban regime was overthrown in 2002, Humaira’s life changed; new rights and opportunities arose. She became a student in the Journalism Faculty at Herat University, “in order to be useful to my country and my society”, and in 2003 started to work for the newly-established, first privately owned radio station in Herat. 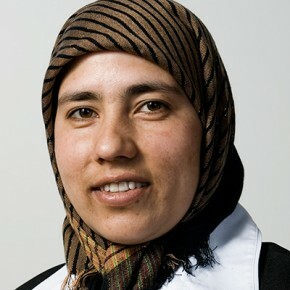 Humaira is now director of Radio Sahar, a community-based radio station in the western province of Herat. Radio Sahar has 15 employees – 10 of whom are women – and broadcasts 13 hours a day, principally educational programming, including poetry and music. Its mission is to promote women’s awareness especially on social, political and cultural issues. It caters particularly to the needs of the majority of its listeners who are women listening to the radio while doing their daily chores. In addition, Radio Sahar addresses the entire community’s need for greater understanding and self assurance vis à vis their society’s development.